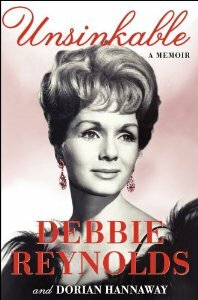 ...A quarter century after publishing MY LIFE, Debbie Reynolds has written a new autobiography, UNSINKABLE: A MEMOIR. Given its April 2nd publication date, I wouldn't be a bit surprised if Debbie were to have a book signing at the TCM Classic Film Festival in late April. Wouldn't that be grand? Let's hope. ...Linda Alexander, the author of the excellent biography A MAVERICK LIFE: THE JACK KELLY STORY, recently spoke at a Friends of the Library luncheon in nearby Huntington Beach, the city where he served as a city councilman and mayor. I wish I'd been able to attend! 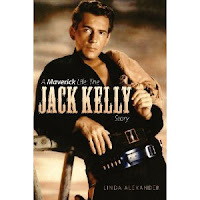 Linda's next book is a biography of Allan "Rocky" Lane. She is also the author of RELUCTANT WITNESS: ROBERT TAYLOR, HOLLYWOOD, AND COMMUNISM. ...While we're on the subject of MAVERICK, a reminder that Season 2 will be available on DVD on April 23rd! ...Somehow I missed the news that a permanent exhibit of John Wayne memorabilia opened last summer at the USC School of Cinematic Arts. It can be found on the 2nd Floor of the George Lucas Building. Items on display include his rifle from STAGECOACH, his Congressional Medal, his hats from RIO BRAVO (1959) and HONDO (1953), his eyepatch from TRUE GRIT (1969), photos from his college days at USC, plus posters and stills. If you pay the exhibit a visit, be sure to also stop by Frank Sinatra Hall at the Norris Theater. 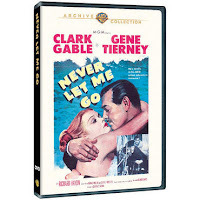 ...The latest releases from the Warner Archive include a batch of Clark Gable titles. 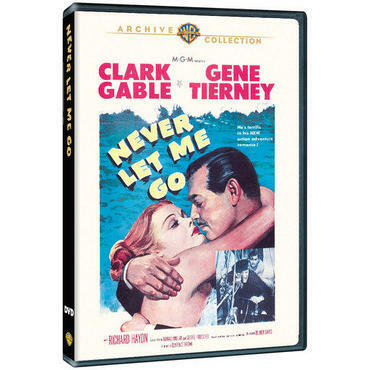 NEVER LET ME GO (1953), costarring Gene Tierney, is a definite buy for me; it may be a tad hokey but I found it very romantic and really enjoyed it. Other Gable titles being released are POLLY OF THE CIRCUS (1932) and KEY TO THE CITY (1950), which I reviewed in 2007. ...Another film due out soon from the Archive which I really enjoyed is CHEYENNE (1947), directed by Raoul Walsh and starring Dennis Morgan, Jane Wyman, and Janis Paige. ...Several drafts of Laurence Olivier's unproduced screenplay for MACBETH, missing for decades, were recently discovered. 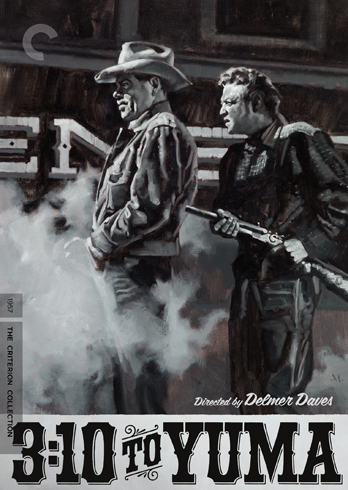 ...Two Glenn Ford films are coming to the Criterion Collection on May 14th: JUBAL (1956) and 3:10 TO YUMA (1957). This is a Glenn Ford spring, as he's also the star of a new set from the TCM Vault Collection, Glenn Ford - Undercover Crimes, which is due out March 18th. ...While I was at the Criterion site, I stumbled across an Eclipse set, The First Films of Samuel Fuller, which came out in 2007. I'm not sure how I'd missed this interesting set until now -- it includes I SHOT JESSE JAMES (1949) with Preston Foster, John Ireland, Reed Hadley, and Barbara Britton, and THE BARON OF ARIZONA (1950) with Vincent Price and Ellen Drew. 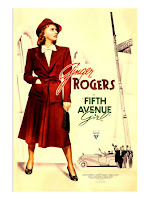 ...Noir fans should be sure to read Kristina's profile of actress Jean Gillie, the star of DECOY (1946), at Speakeasy. While you're there, hang around to read Kristina's movie reviews, link roundups, DVD shopping lists, and more! ...My fellow Chester Morris fans will want to be sure to check out this Chester Morris website, which has lots of great photos. ...Several months ago some Georgetown Cupcakes were shipped to my daughter's place of business as a thank you gift. She thought it was the best cupcake she'd ever had. We just learned that a branch of Georgetown Cupcakes opened in Los Angeles last November. Looking forward to trying them sometime. ...There may be a new film produced about the Dunkirk evacuation during WWII. I'm all for it, as I found the 1958 film on that topic something of a disappointment, failing to capture the scale of what was accomplished. I just hope the new film isn't filled with the overly obvious use of CGI which plagues some new films. When it's readily apparent to the audience that you're using green screens, you're not doing it right. ...Harrison Ford confirmed to star in Disney's new STAR WARS movies? My younger daughter joked she wouldn't believe anything about the upcoming STAR WARS films until she's in the theater and the credits are rolling. 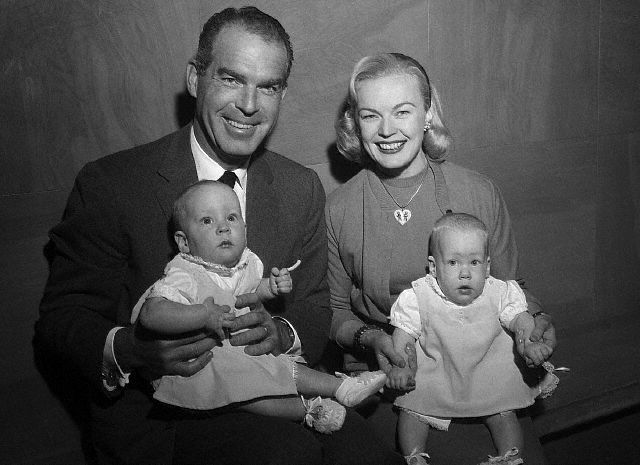 ...At Hollywood Comet, Jessica prepared a very thorough Valentine's Day post about Hollywood's successful long-term marriages. It's uplifting to realize how many there were! ...Want to know if there's anything in a movie during or after the end credits? There's an app for that! ...Kyle Chandler is going to star in a Showtime pilot called VATICAN. Interesting timing given the historic news from Rome this past week. ...At Cinematically Insane, Will writes about the great "1933" pre-Code festival at New York's Film Forum. What a fantastic series! ...Among the many interesting reviews I've read of late, here are a few: At The Stalking Moon, Jeff reviewed FANTASTIC VOYAGE (1966), which looks like lots of fun...At Classic Movie Man, Stephen compares the plot of Ginger Rogers' FIFTH AVENUE GIRL (1939) to DOWNTOWN ABBEY, which both feature very politically active chauffeurs...Mike Clark of Home Media Magazine reviewed the new Warner Archive release DEATH IN SMALL DOSES (1959), starring Peter Graves and Mala Powers...the Self-Styled Siren wrote an intriguing review of Jean Simmons in HOME BEFORE DARK (1958)...Vienna of Vienna's Classic Hollywood shares my love for "B" movies -- I'd love to see Virginia Grey in SMOOTH AS SILK (1945), one of her recently reviewed titles. ...And even more reviews! 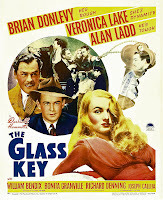 The Greenbriar Picture Shows "Watch List" is always interesting; titles this week include Linda Darnell, Lynn Bari, and Benny Goodman in SWEET AND LOWDOWN (1944)...At Journeys in Classic Film, Kristen reviews Alan Ladd and Veronica Lake in THE GLASS KEY (1942). I just took a fresh look at that one last month...Mark reviews Joseph Cotten and Teresa Wright in Andrew Stone's THE STEEL TRAP (1952) at Where Danger Lives...Judy of Movie Classics writes about Loretta Young and David Niven in ETERNALLY YOURS (1939)...and today Rupert of Classic Movies Digest reviewed a Joan Bennett film I really liked, THE MAN I MARRIED (1940). ...There's a lovely tribute to the late John Kerr at Classic Montgomery. There's a beautiful photo from SOUTH PACIFIC (1958), and I also learned something new about Kerr's background. Thanks very much for the mention, Laura, and for the great collection of links here. I had somehow missed the report about Olivier's scripts for 'Macbeth' and am fascinated by this story - it sounds as if it would have been very different from the Welles version and others. Have a great week! I agree that the Academy does not do well with their In Memoriam segment--they did better at one time, but that seems a long time ago. They seem to have little feeling for cinematic history now, and the people that are truly important in it in the long view. I watch the Oscars though I don't know why (maybe just because I always have and you get used to it)--they are not a significant measure of anything. I do partly watch for In Memoriam but have been so disappointed some times. This year I'm really concerned that they are going to leave out the one person who I most would like to see there--Harry Carey Jr. They don't care about supporting players from the past, even ones as good as he was and in such great classic films, and I'm concerned the people going over a list for names won't even realize the thread of film history that begins with his father, the great Harry Carey, being the key man at the start of John Ford's career, and Dobe later becoming so significant in Ford's stock company and writing the best book about working in Ford's movies with the wonderful COMPANY OF HEROES--and there are few people left with such resonance to the world of Ford, which should rightfully be considered as something rare and special in American cinema. Really, if Carey is left out, there are going to be people there who are so much less meaningful and that just makes me sad. Yes, I thought of writing a letter but haven't. I did it once--for Burt Kennedy, not only one of the best screenwriters ever and an accomplished director later on, but someone I knew and very much admired by his peers. I wrote an articulate letter but they left him out anyway so I guess it killed my initiative. Thanks for the kind words re my Walker/Kerr entry on Class Montgomery. Twas nice of you. Love your Blogosphere post as always. Whenever you mention a blog I don't know, I end up spending an hour or more catching up on posts! This time it was Hollywood Comet, great site , so thank you. And a big thank you for giving my blog a mention. BARON OF ARIZONA is an unusual film as Vincent Price schemes to prove Ellen Drew actually owns Arizona! 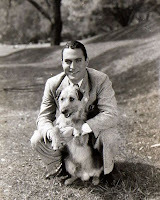 A Chester Morris website? I'm there. Thanks so much for the heads up. Laura, you have quite a treasure trove this week! 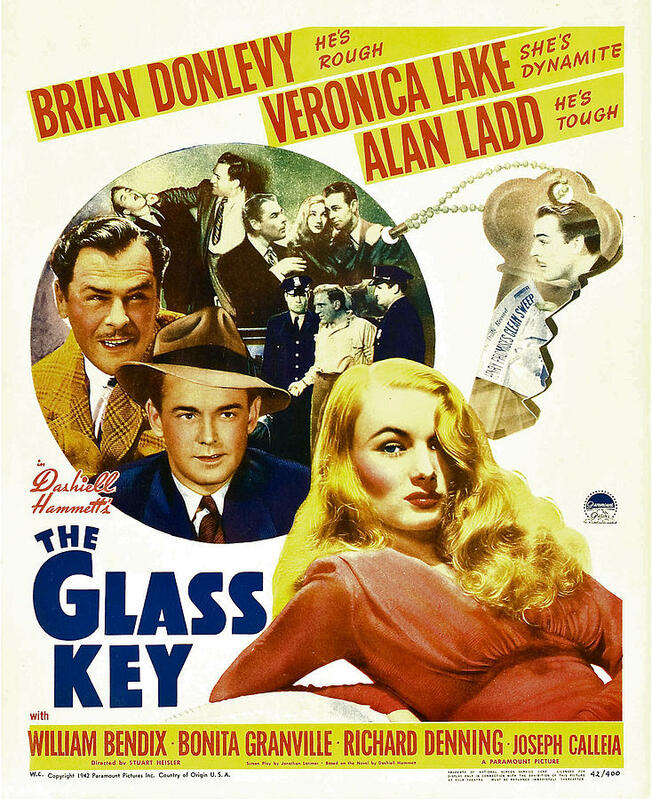 I'm especially looking forward to the review of Journey's post of THE GLASS KEY and Chester Morris! thank you Laura! I love your roundups, and really appreciate when you mention me in them! I too always discover something new every week. Just to pick one of these nuggets, excited about that 3:10 TO YUMA release. 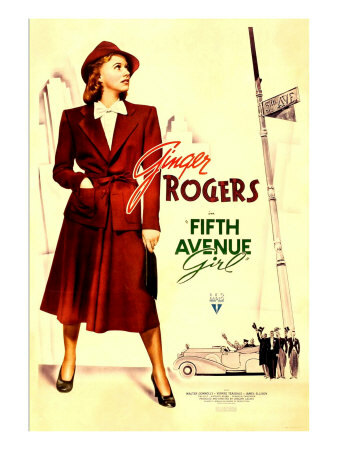 One of my fave Glenn Ford movies. Cheers! You're welcome, Judy! Wasn't the Olivier story interesting? Kathy, really enjoyed that Walker/Kerr post. Thank you for stopping by! Kevin and Dorian, love knowing you share my enjoyment of Chester Morris! Vienna, so glad you have enjoyed exploring the work of fellow bloggers. BARON OF ARIZONA sounds interest! Season 2 of Maverick??!! I'm there! I guess this means Season 1 sales were satisfactory and later seasons will follow. I think "Shady Deal at Sunny Acres" is my favorite episode, not only for its clever writing, but for how deftly it wove in so many of the series' recurring characters. One of the great cappers of TV history is John Dehner's reading of the line, "He did it!" Well, Blake, you were right to worry -- this year's memorial reel omitted Harry Carey Jr. There's just no sense of history, but what should we expect, I guess, when the show wants to be just "the Oscars" and omit reference to it being the 85th Academy Awards? They also left out Ann Rutherford, Tony Martin, and Andy Griffith. Sigh. I so agree with you, Jim! MAVERICK is the best, and "Shady Deal" is classic. One of the truly perfect episodes in TV history. Ann Rutherford, Tony Martin, AND Harry Carey Jr. were ALL stiffed in the Oscars' Memoriam?! How disappointing and annoying! Oh, well, at least TCM Remembers showed these beloved stars a little respect.